This lollipop loop heads north across the Benicia-Martinez Bridge to Fairfield on Lopes Rd. 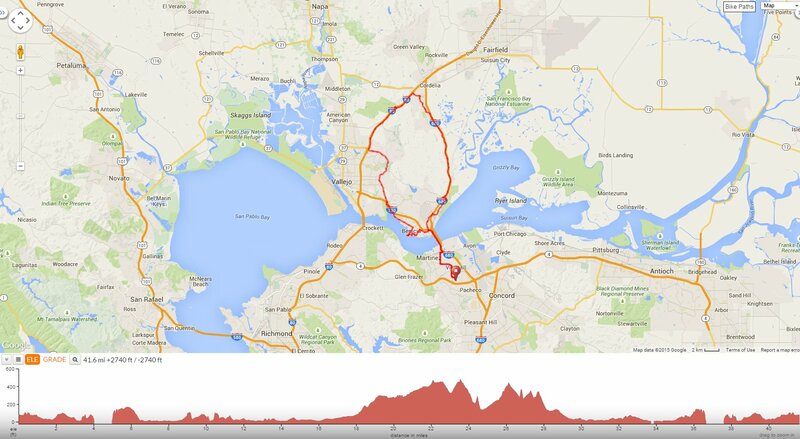 Return south with a stop at Lynch Canyon followed by a rolling stretch along the Solano Bikeway into Vallejo. Take Columbus Pkwy into Benicia for a stroll through Benicia State Park out to the gorgeous waterfront area. The mile long incline across the bridge has an average grade of 4.5% up to the center of the path before dropping to the other side onto Park Rd in Benicia. Enjoy the views of Carquinez Strait and Franklin Hills! Park Rd goes pass the Benicia Historical Museum and the Amport car lots before the descent along the pipe lines to the Valero Oil Refinery. Head north on Industrial Way under the Benicia Trestle through the industrial area along Suisun Bay. There are marvelous views of the Mothball Fleet, Mt Diablo and the surrounding marshes and wetlands along Goodyear Slough. Lopes Rd goes through the residential subdivisions of Fairfield/Cordelia to Gold Hill Rd. Meander through the homes along Oakbrook Dr to Red Top Rd. Red Top Rd cuts across the canyon westward towards I-80. Turn left on McGary Rd; this less traveled frontage road flows along the rolling hills on the east side of I-80 through American Canyon. The right turn on Lynch Canyon leads you into the parking lot at Lynch Canyon. Stop at Lynch Canyon picnic area. Exit Lynch Canyon and continue south along American Canyon on McGary Rd. After passing Hiddenbrook Pkwy, make a slight right onto Solano Bikeway; this path hugs the east edge of I-80 and spills out at Sulphur Spring Valley onto Columbus Pkwy in Vallejo. Head east on Columbus Pkwy for the gentle climb up towards Blue Rock Springs Park. The descent on Columbus Pkwy winds down through the residential subdivisions along the edge of Vallejo to the strip malls at Rose Center in Benicia. Turn right onto the sidewalk off Rose St and take the path across I-780 to the Bay Area Ridge Trail through Benicia State Recreation Area. Exit the trail onto W K St; the road goes along the residential neighborhoods to Benicia’s downtown waterfront area on 1st St.
Ride out to the end of the road on 1st St and stop at Benicia Point Pier. This is a great place to take in the views of the Carquinez Bridge and Benicia-Martinez Bridge, the blue waters of the Carquinez Strait and the Franklin Hills. Exit the waterfront back to 1st St and meander around Benicia Marina along the multi-use path off B St to the exit at Turnbull Park. Exit the path onto 5th St and take Military E St towards the Historic Arsenal District to Jefferson St.
Head up Park Rd to the Benicia-Martinez Bridge Trail and simply reverse the route back on Shell Ave, Pacheco Blvd and Morello Ave to Holiday Highlands Park. This is a wonderful scenic loop along some of the less traveled roads around Solano County. Get out and enjoy Benicia’s old downtown area and take in the gorgeous waterfront views along Carquienz Strait! Weather: Sunny, breezy and warm. Temps ranged from the low 60’s to the mid 80’s with brisk SW winds.